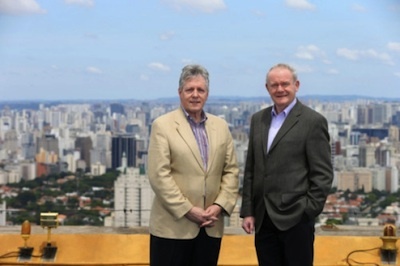 Martin McGuinness and Peter Robinson are in Sao Paulo behind a display of George Best memorabilia, all smiles for the photographers. It won’t do. Everyone here and a lot of people in Brazil know they are conducting a charade at vast public expense. They are like a married couple who maintain a facade for the neighbours but live separate lives inside their own house. Do they imagine for a second that journalists in Brazil are incapable of telling people the truth about the frozen wasteland at Stormont? In these days of internet and instant communication do they not realise that anyone with the least interest in investing here can see on TV or laptop the images of flag-waving unionists rioting and petrol-bombing police, the most recent occurring as the posing pair jetted off? Besides, the number of Portuguese and Brazilians living and working in the Dungannon district are more than capable of telling their relatives and friends what’s really going on here. The whole expensive delusion in Brazil is nothing more than an extension of the political fraud that is going on up at Stormont where nothing is going on. There isn’t enough business to keep the assembly occupied for three days a week, though that hasn’t stopped members - apart from the SDLP - awarding themselves a £5,000-a-year pay rise. We’re going to be treated to regular Brazilian updates as the first minister and the deputy first minister swan around fooling no-one as they pretend everything is rosy in the garden. It’s a lot more serious than the failure to have anything of substance processed through the seized machinery at Stormont. The behaviour of unionists in the past six months has been appalling. It began publicly last summer with almost every elected unionist in Belfast, including, disgracefully, First Minister Robinson, repudiating the Parades Commission and thereby implicitly endorsing so-called loyal orders who intended to ignore the Parades Commission rulings. In December unionists called their cannon fodder out on the streets in spurious protests about flags, leading to attempted murder of police, death threats, millions of pounds lost to business and only reluctantly advised people to stop protests long after the damage had been done. Many unionist elected representatives participated in the protests and some played a very ambivalent role among violent rioters. At the bottom of these disgraceful performances lies a deceit propounded by unionists - principally that their ‘Britishness’, which they have been unable to define, is being chipped away, that their values, again undefined, are in danger. It is disgusting that unionist leaders mislead people so brazenly. They know that the Good Friday Agreement (GFA) ratified by Dublin and London and by a referendum, guarantees their rights as British citizens just as it guarantees people’s Irishness or their right to be both if they wish. They know also there can be no change in the position of the north without consent of a majority. Yet they dishonestly feed the fears of the mobs blocking roads and attacking police. What is true is that the DUP never subscribed to the Good Friday Agreement and insisted on having its own version, the St Andrews Agreement. However, they know full well that St Andrews is a mere codicil to the Good Friday Agreement and a fig leaf to enable Paisley to become first minister. Again, misleadingly, DUP figures claim St Andrews is all there is and repudiate all the guarantees of rights and diversity contained in the GFA which is the best deal unionists ever got. Why do they repudiate these rights, duties and obligations? There are two reasons, both unworthy. One is that if they accept them, it means the other side, them’uns, have to get them too. The other reason, and on the DUP’s record the more likely, is that it doesn’t believe it can or should make any agreement with Sinn Fein until Sinn Fein repents and apologises for the past 40 years. Unionism is blameless. It’s another way of trying to avoid living on equal terms with the rest of the people in the north which is fundamentally what all the flag-waving and rioting is about. McGuinness and Robinson should stay at home until they’ve got that sorted out.